Not long ago I wrote about how Adam Savage from Mythbusters loves portable bandsaws. 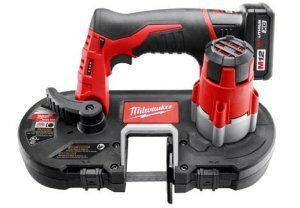 Since he does a lot of traveling for the show, I think he might get a kick out Milwaukee's latest cordless bandsaw which holds the title of lightest and most compact bandsaw on the market. Milwaukee's bandsaw is also the first to run on only 10.8-volts (M12). Weighing in at only 6.75lbs and only 1-foot in length, the M12 Milwaukee Bandsaw can be easily handled and used with only one hand. The saw also meets the OSHA guidelines for one-handed operation with the integration of a lower guard that covers the saw blade outside of the active cutting area. With a cutting capacity of 1-5/8-inch, the saw can handle 1-5/8-inch Unistrut, 3/4-inch EMT, 3/8-inch threaded rod and more. It looks like electricians and plumbers are the likely target audience for the tool. The M12 Cordless Bandsaw will be available in a full kit (2429-21XC) which includes the tool, an 18 TPI blade, 1 Redlithium M12 XC high capacity battery, a 30-minute charger, and a hard case. The tool-only (2429-20) includes the tool and an 18 TPI blade.